There is not a cost to view this presentation. This presentation was recorded LIVE on September 14, 2018 and is approximately 45 minutes. Once you're logged in, click the "ENTER" button found in the Course Summary box to the right. Your registration will then be confirmed. Once you register for the course, you will have 180 days (approximately 6 months) from the date of enrollment to complete the course. The exact date that your access expires will be indicated within the Course Summary box on this webpage. Recognize the need and the challenges for objective shoulder movement measurements. Identify and differentiate the contributions of scapular and glenohumeral components to arm movement. Summarize the pros and cons of the difference human movement measurement methodologies. Appraise the shoulder joint research we do at the DMU Human Performance Laboratory. 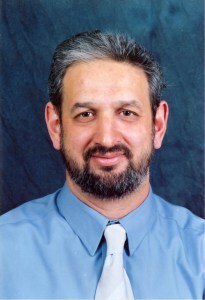 Dr. Vardaxis’ research is in human biomechanics. He studies the movement, load, and response of the musculoskeletal system under typical and constrained conditions aiming to understand and describe risks to pathology onset, progression, and rehabilitation. Specifically with respect to the shoulder, in the Human Performance Laboratory he currently focuses on measurement and description of the healthy shoulder movement under various clinically relevant experimental conditions. His longer-term aim is to overcome the measurement challenges of the healthy and pathological shoulder movement/function using non-invasive, valid, and reliable measurements that are sensitive enough to be used in the clinical setting for evaluation and intervention assessment purposes. Copyright: All rights reserved. By viewing this activity, participants agree to abide by copyright and trademark laws, intellectual property rights, and all other applicable laws of the United States of America. No part of the syllabus may be used or reproduced in any manner whatsoever without written permission, except in the case of brief quotations embodied in articles or reviews. Internet CME Policy: The Office of Continuing Medical Education (CME) at Des Moines University (DMU) is committed to protecting the privacy of its customers. DMU CME maintains its Internet site as an information resource and service for health professionals. DMU CME will keep your personal and credit information confidential when you participate in an Internet based program. Your information will never be given to anyone outside of the DMU CME program. DMU CME collects only the information necessary to provide you with the services that you request.